Drew Brees, quarterback of the Super Bowl Champion New Orleans Saints, showed poise and percision on the National Football League’s grandest stage, yet his trip to the NFL Championship has traveled many roads, including the Little League route. Growing up in Austin, Texas, Mr. Brees was a hard-throwing pitcher and a stout hitter in Western Hills Little League (WHLL). He and his younger brother, Reid, were members of the WHLL Yankees. As children, the Brees brothers were engrossed in sports, and benefited from parents who appreciated the value of sports beyond wins and losses. Mr. Brees’s mother, Mina, was an all-state track, volleyball and basketball player in high school, while his father, Chip, played freshman basketball at Texas A&M University. While developing into a standout player in Little League, Mr. Brees also displayed his athletic prowess in a variety of other sports. At the age of 12, he was the top-ranked tennis player in Texas. That same year he set an Austin city record with 14 Little League home runs. A few years later, Mr. Brees starred in three sports at Westlake High School: football, basketball and baseball, where he was a power-hitting infielder and a hard-throwing right-handed pitcher. Mr. Brees attended Purdue University, and amassed a string of accomplishments and accolades on and off the football field. Drew Brees, Quarterback of the NFC Champion New Orleans Saints, played Little League in Western Hills Little League in Austin, Texas. A Heisman Trophy finalist in 1999 and 2000, Mr. Brees did not win the most prestigious award in college football, but he did receive the Maxwell Award as the nation's outstanding player in 2000, and was a finalist for The Davey O'Brien Award as the nation's top quarterback in 1999 and 2000. He ended his collegiate career as the Big Ten Conference’s all-time leader in passing yards (11,792), touchdown passes (90), total yards (12,693), completion percentage (.611), completions (1,026) and attempts (1,678). As a senior, Mr. Brees was named Academic All-America Player of Year and was the recipient of Purdue’s Leonard Wilson Award for unselfishness and dedication. He also was honored as the first recipient of the Socrates Award, recognizing the nation's finest athlete in terms of academics, athletics and community service. Mr. Brees completed his degree in industrial management and manufacturing in 2001, and graduated with a 3.4 GPA. A veteran of nine NFL seasons, Mr. Brees arrived in New Orleans in 2006 as a free agent after being selected 32nd overall in the 2001 draft by the San Diego Chargers. During his time in New Orleans, the Saints have steadily climbed up the ranks in the National Football Conference (NFC). This year, Mr. Brees guided the franchise to a 13-3 regular-season record, three playoff wins (the Saints collected only two playoff wins in their first 42 years), and its first Super Bowl championship in its first appearance. 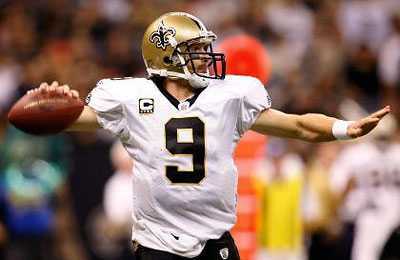 Super Bowl 44's Most Valuable Player, Mr. Brees completing 32-of-39 passes for 288 yards and two touchdowns. During the 2009-10 season, Mr. Brees threw for nearly 4,400 yards and 34 touchdowns, completing more than 70 percent of his passes. Mr. Brees and his wife, Brittany, are extremely active throughout New Orleans, with his Brees Dream Foundation, with the mission to provide care, education and opportunities for children facing adversity. His ongoing charitable efforts have raised funds for Operation Kids, and he also has held The Drew Brees Gridiron Classic for youth football teams, the “Brees on the Seas” youth deep sea fishing event off the Louisiana coastline, hosts an annual golf tournament that distributes money to children's causes in New Orleans and San Diego, rebuilt homes in New Orleans with Habitat for Humanity, supported Children's Hospital in New Orleans and numerous other charitable endeavors. With more than 100 teams already registered for the 50-70 Pilot Program, announced two weeks ago, the program has already had a great start, with dozens of leagues and more than 100 teams signed up so far. In an effort to further ease the transition from the standard Little League field size (46-foot pitching distance and 60-foot base paths), to the Junior/Senior/Big League field (60.5-foot pitching distance and 90-foot base paths), Little League is now offering the pilot program for league age 12- and 13-year-olds. The pilot program will be conducted on fields that feature a 50-foot pitching distance and 70-foot base paths. The pilot program is available to all Little League programs worldwide for the 2010 season. The announcement was made on Little League’s Internet site on Jan. 11, as well as on Facebook and Twitter. Details also were e-mailed to those who have signed up to receive email updates from Little League. After the 2010 regular season, each participating league will be required to complete a post-season survey detailing the benefits and challenges. At the Facebook page dedicated to Little League, scores of questions have been answered by Little League International since the announcement on Jan. 11. Currently, Little League has more than 9,000 Facebook fans in 44 countries and six continents. “Sending emails to volunteers is a good way for us to provide information to a large number of volunteers, so we will continue to do that” Chris Downs, Little League International Director of Publicity, said. “And individual volunteers can always contact their regional office by email for answers. Signing up to be able to view all the questions and answers regarding the 50-70 Pilot Program on Facebook is easy, and free. Simply click on the link below and follow the instructions for signing up. One of the most common questions relates to field space. Many have pointed out that they do not have a field in their boundaries that could accommodate a 50-70 division. However, they may not realize that the field is not required to be inside the league’s boundaries to be usable. For instance, if only one field is converted to 50-70 play in a given area, any chartered Little League could use that field to play 50-70 games, provided certain conditions are met as noted below. That would allow, for instance, some or all of the leagues in a given district to charter for the 50-70 Pilot Program in 2010, and play those games on a single field. Another solution may be to convert an existing “standard” Little League field (a field with 46-foot pitching distance and 60-foot base paths) to a 50-70 field, but to allow that field to be used for BOTH divisions. For 2010, there will not be a separate level in the International Tournament for the 50-70 Pilot Program. However, local leagues and districts that are participating in the program will be able to organize tournaments using a Special Games Request Form. Any player who participates in the pilot program during the regular season will be eligible to participate simultaneously in the Little League Division (for players ages 9-12) or the Junior League Division (12-14). Such a player will be eligible for selection to either age-appropriate International Tournament Team. However, a player who participates solely in the 50-70 Pilot Program also will be eligible based on his/her age for selection to a team participating in the International Tournament (only for the 2010 season as a part of this pilot program) under guidelines established for player eligibility. Leagues will be allowed to operate under interleague play and combined teams. However, players will only be eligible for tournament in the league where they reside. Leagues will be allowed to structure the 50-70 Pilot Program so that their typical season is conducted, for example, on Monday through Friday. Then on Saturday and Sunday, leagues could offer the pilot program to players who wish to participate. All pitching guidelines apply. Participating leagues (and districts with participating leagues) will be permitted to organize tournaments using a Special Games Request Form for players in the 50-70 Pilot Program. Players may participate in both Special Games and the International Tournament under guidelines established in the Baseball Rulebook. In the 50-70 Pilot Program, ONLY players who are league ages 12-13 will be eligible in 2010. Additionally, base runners will be permitted to lead off in the 50-70 Pilot Program (requiring pitchers to hold runners on base), runners may attempt stealing at any time, and head-first sliding is permitted. In the Little League division, runners cannot leave the base until the ball reaches the batter, and sliding must be feet-first unless the runner is retreating to a base. Also for the 50-70 Pilot Program – unlike the Little League division – the batter becomes a runner on a dropped third strike, the bat can have a diameter of 2 5/8 inches, and the on-deck batter is permitted. The fence distance in the 50-70 Pilot Program is up to the local league to decide. It is recommended that the distance be at least 200 feet, but not more than 300 feet. In the 50-70 Pilot Program, the height of the pitcher’s plate, in relation to the level of home plate, is eight inches. During this time of year we take time to reflect on the year that was. As we enjoy the company of family and good friends, I want to take just a moment to express my personal appreciation for the volunteer leadership you provide the Little League program. Each year, Little League invigorates communities around the world through the extraordinary efforts of District Administrators, Assistant District Administrators and more than a million local league officials and volunteers. The Little League program could not maintain its respected status as the leader in youth sports without its corps of tireless volunteers. At Little League International we recognize that our volunteers are the foundation strength of this incredible movement and we can never say thank you enough. Much success was enjoyed by our program in 2009, as we celebrated our 70th anniversary season. This year, extensive renovations were completed to the Little League International Headquarters building in South Williamsport, Pa., and we moved our Southeastern Region Headquarters to Warner Robins, Ga., where construction is ongoing. Its first games will be played in the summer of 2010. Also in 2009, our organization has connected with thousands of Little League fans and supporters via the Internet through the creation of several pages on Facebook and Twitter, and by way of a partnership with Youth Sports Live, which webcasts local Little League games from different locations across the United States. Obviously, we hope these positive trends continue into 2010. With your help they can, and we are here to help you. Please don't hesitate to call upon the professional staff in South Williamsport, or at your regional office for assistance. We have a very capable team of people ready to help with all aspects of league and district operations. We appreciate the thousands of you who will make the sacrifices necessary to provide millions of children with the Little League experience in 2010. This spirit of giving is a testament to the value of the Little League program, and it is the reason we are optimistic about the memories and successes that are to come with the 2010 Little League season. In the meantime, I want to thank you again for another great Little League year, and send my warmest wishes to you and your families for a safe, healthy and happy holiday season. Ever since Little League debuted baseball for teenagers 50 years ago, the standard infield has featured a pitching distance of 60 feet, six inches, and base paths of 90 feet – the same size as a professional baseball infield. The program grew over the years to its current status as the largest teenage baseball program in the world. A few years ago, Little League added the option of allowing 12-year-old players to “play up” in the Junior League Division for Regular Season and Tournament Play. Now, in an effort to further ease the transition from the standard Little League field size (46-foot pitching distance and 60-foot base paths), Little League is offering a pilot program for league age 12- and 13-year-olds. The pilot program will be conducted on fields that feature a 50-foot pitching distance and 70-foot base paths. The pilot program will be available to all Little League programs worldwide for the 2010 season. Each league wishing to participate in the 50-70 Pilot Program is required to enroll with Little League International prior to initiating the program. At the conclusion of the regular season, each participating league will be required to complete a post-season survey detailing the benefits and challenges. However, a player who participates solely in the 50-70 Pilot Program also will be eligible based on his/her age for selection to a team participating in the International Tournament under guidelines established for player eligibility. Later this month, Little League International will provide leagues with the procedure for participating in the 50-70 Pilot Program.